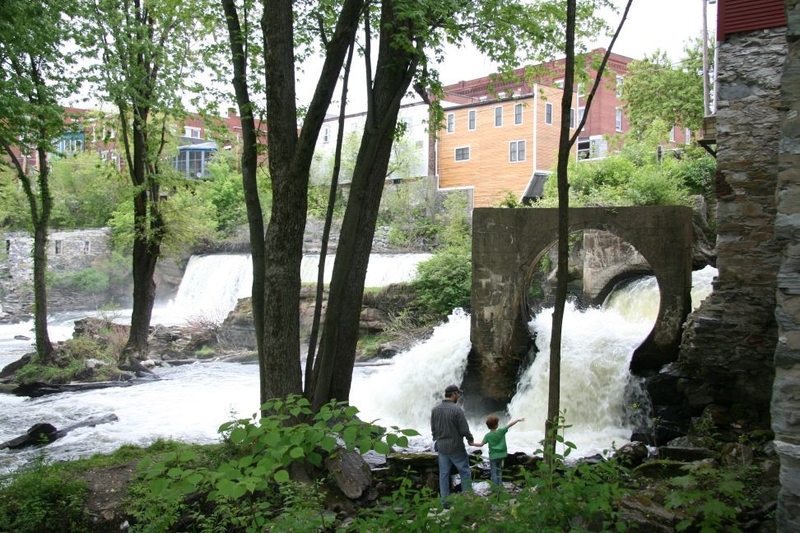 (Host) Middlebury is split in half by the Otter Creek, which spills over natural falls right downtown. Where clothing and jewelry shops now get the benefit of a waterfall view there used to be mills. In the late 1800s the Middlebury Electric Company harnessed the falls for power. But since the 1960s, the falls have just been falls. Now, the power may be coming back on. (Lindholm) Anders Holm is a local ear, nose, and throat doctor making a surprise change of career: he’s recreating the Middlebury Electric Company. (Holm) "There definitely is a history of sort of waxing and waning use of the falls-boom and bust times. The condition right now is definitely a bust time but we’re hoping to revitalize the falls here." Holm is already repairing the old rotten sluice gate. And he has plans for a modern turbine at the base of the falls and a subterranean powerhouse further down. He’s been mulling it over for years and thinks now is the right time to re-examine local energy production. (Holm) "Certainly electricity is getting more expensive but also we’re thinking more of where our electricity is coming from and the cost not only fiscally but also environmentally. Every kilowatt hour that you produce locally is one less kilowatt hour that you have to buy from Massachusetts or wherever. And certainly I’d like to think that the kind of electricity we’d be producing here is very low impact and supported by the community." (Lindholm) When contracts with Vermont Yankee and Hydro Quebec begin to expire in a couple of years, the rates our utilities pay for power could skyrocket. John Tenny is chair of the Middlebury selectboard. He says in light of the uncertain future, the town is definitely interested in Holms’s proposal…with some reservations. (Tenny) "I think it’s wonderful for the community. What we need to do looking forward is to determine can this be feasible, how much power can it actually produce? We really don’t have all of that information." (Lindholm) Anders Holm says construction could cost as much as $4million. At peak, the plant would be able to power about 500 homes. But he doesn’t yet know how much that power generation will cost. Selectboard Chair John Tenny says the town isn’t interested in financing the project through taxes. So Holm will have to find outside funding and grants. But with construction costs taken care of, the town *might be willing to pay a little extra per kilowatt hour for a locally generated source. (Tenny) "We could look at a longer term in which the cost of this power would be a reliable cost and we would not be in a position that was dictated by outside interests that we could not control." (Lindholm) At the base of the falls, there now is just a gaping concrete arch, but it could soon be a working penstock. Standing nearby, environmentalist and writer Bill McKibben says that’s the right way to be thinking. (McKibben) "We have the sun, we have the wind, we have the water…these are the kind of small sources that could give us not only enough energy but a kind of new economy that’s much more locally based. Lots of people bringing small amounts-500 houses worth of energy-to the table, if we build in that direction we’re going to end up in a much wiser place." According to hydro developers, the Middlebury falls may be one of the few remaining viable sites in the state. So this kind of hydro-electric development may not be able to be replicated elsewhere. Assuming permits are granted and all the parties agree, the Middlebury plant could be ready to begin generating power in 2012-just as Vermont’s big energy contracts expire. For VPR news, I’m Jane Lindholm.